Posted on May 28, 2015 at 4:43 pm. 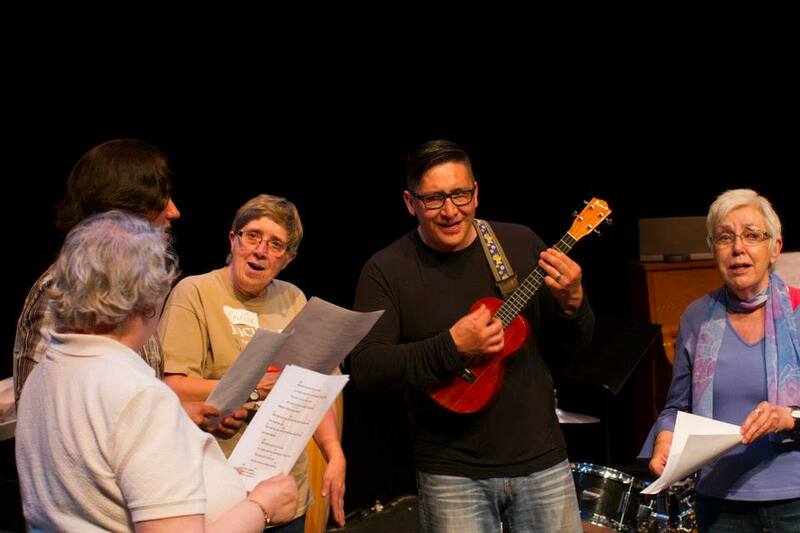 Join us for a potpourri of music, theatre, poetry and storytelling at the Arts Café on June 6 and close out the 2015 Creative Age Festival in style! Saturday, June 6 from 1 – 3 p.m.
You’ll be treated to a potpourri of music, theatre, poetry and storytelling at the ever-popular NESA Arts Café which closes out the 2015 Creative Age Festival. Author, artist and musician Alida VanBraeden will read from her book of poems, Dancing Into Eternity, and play a composition she wrote for guitar. Long-time writer and writing instructor Shirley A. Serviss will entertain with storytelling, and the Rural Route Actor’s Troupe will perform a short skit. The arts café will also feature diverse musical performances from the Choralaires, NESA Handbell group, African Drumming Group and Beth Dunbar. Please join us Saturday, June 6 from 1 – 3 p.m. at the North Edmonton Seniors Association (7524 139 Avenue) Tickets are not required but a $2 donation is suggested. Pre-registration is not required. Read on for background information about some of our talented performers. The Rural Route Actor’s Troupe was formed 5 years ago to provide artistic outlet to area citizens and entertainment to rural audiences. The Troupe is open for all. They have performed a variety of plays and skits to audiences in a number of rural community halls from Duffield to Beaver Meadows, north of Niton Junction. They rehearse at Zion United Church located between the communities of Alberta Beach, Darwell and Wabamun. Shirley A. Serviss is a long-time participant in Edmonton’s literary scene as a writer and writing instructor. She has published three collections of poetry and her work has appeared in numerous literary magazines and collections. Shirley is the staff literary Artist on the Wards for the Friends of University Hospitals. The Northgate Seniors Handbell program was started seven years ago when a set of handbells was discovered in a cupboard at the center. Some of the ringers have been in the choir years; some are in their first year. The group has performed at churches, hospitals, seniors residences and at various Northgate events including previous Arts Cafés. The Choralaires have entertained audiences in Edmonton and the surrounding area for nearly 30 years. They have performed at the Legislature, nursing homes, private functions, at every Creative Age Festival and put on an annual spring concert. Posted on May 27, 2015 at 1:00 pm. 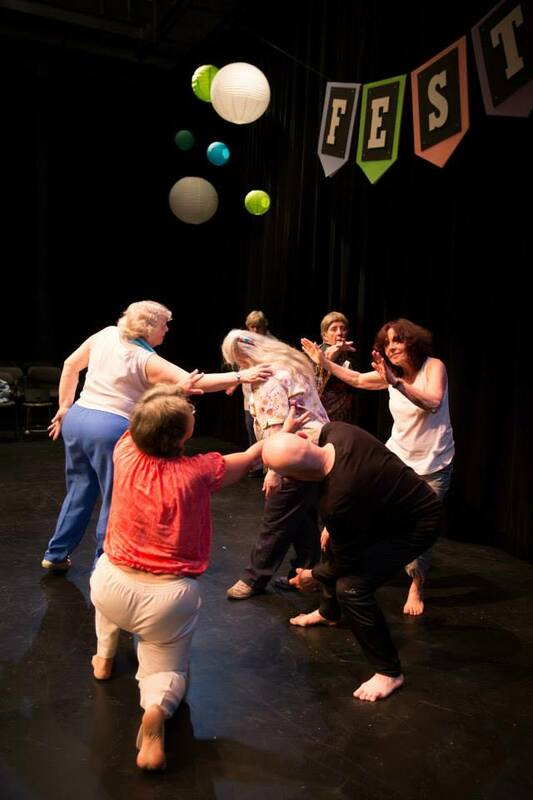 Join us at the Creative Age Festival June 4-6 and take a workshop or see a performance. Experience the joys and challenges of working with clay at our Pottery Workshop led by facilitator Elaine Kwan. You’ll learn the basics of handbuilding with pinching and coil techniques to build a small flowerpot or pencil holder. Come out on Thursday, June 4 from 10 a.m. – 12 p.m. and have fun with clay! The cost is $15 and all supplies, glazing and firing costs are included. The workshop is held at North Edmonton Seniors Association (7524 139 Avenue). Call 780-496-6969 to register. Posted on May 26, 2015 at 9:37 pm. It’s not very often that people get the chance to play handbells or a Djembe (African drum), but at this year’s Creative Age Festival you can try both instruments! The Handbells Workshop with Wendy Hoskin will cover basic ringing techniques, how to read handbell music, and how to participate in an ensemble. No experience is needed because you’ll be doubling a position with an intermediate ringer as you learn to ring beginning music. Thursday, June 4 from 2 – 4 p.m. Cost: $15. At the African Drumming Workshop Deborah Bortscher will teach techniques to achieve the three basic sounds on a Djembe – bass, tone and slap. Using your new-found skills you’ll learn to play a drum song from West Africa. Drums are provided or you can bring your own. Saturday, June 6 from 10 a.m. – 12 p.m. Cost: $15. Register by calling NESA at 780-496-6969. Both workshops are held at North Edmonton Seniors Association (7524 139 Avenue). Posted on May 22, 2015 at 4:35 pm. Not sure if taking a workshop is right for you? Hear what past participants have said. Be sure to register for some workshops at the Creative Age Festival June 4-6. We have a great variety of arts workshops lined-up including: African Drumming, Watercolour Painting, Acting Shakespeare, Pottery, Performance Storytelling, Handbells, Dance and Physical Storytelling, Musical Improv, and Memoir Writing. To register call NESA at 780-496-6969. Posted on May 21, 2015 at 7:11 am. Join us on June 5 for an evening of performances by talented seniors and intergenerational artists. Featuring the Grove City Barbershop Harmony Chorus, Melle Huizinga, the GeriActors & Friends, and more! The show will take place at the Timms Centre for the Arts (87 Ave & 112 Street). There will be a reception in the lobby to follow and a cash bar available before and after the show. Tickets are $10 and can be purchase through the North Edmonton Seniors Association (780-496-6969). Tickets will also be available at the door. The Grove City Barbershop Harmony Chorus is made up of around 30 men from all over the Greater Edmonton area. Some drive over an hour to each of their Wednesday night practices. Coming from all walks of life and virtually all ages, they are all amateur singers who enjoy singing together and sharing their talents. Their chorus has been active for over 20 years and is the only chorus north of Red Deer. They are part of the 23,000 man, worldwide Barbershop Harmony Society. In addition to their annual shows they also do many singouts around the Edmonton area, including hospitals, nursing homes, and fundraisers for various charities. They compete at least once a year with other barbershop choruses in Alberta. Melle Huizinga immigrated with his family to Canada in 1948. As a child and as a teenager he was determined to be a farmer but fate intervened and he taught school for 40 years instead. He learned to love teaching and he keeps his hand in by mentoring student teachers at the King’s University and by teaching a creative writing class through the Minerva Institute for senior studies at MacEwan University. Melle Huizinga loves to tell stories. The story he tells today, from his first year of teaching in a small Ontario town, is titled “Blundering into Small Town Power Structures”. 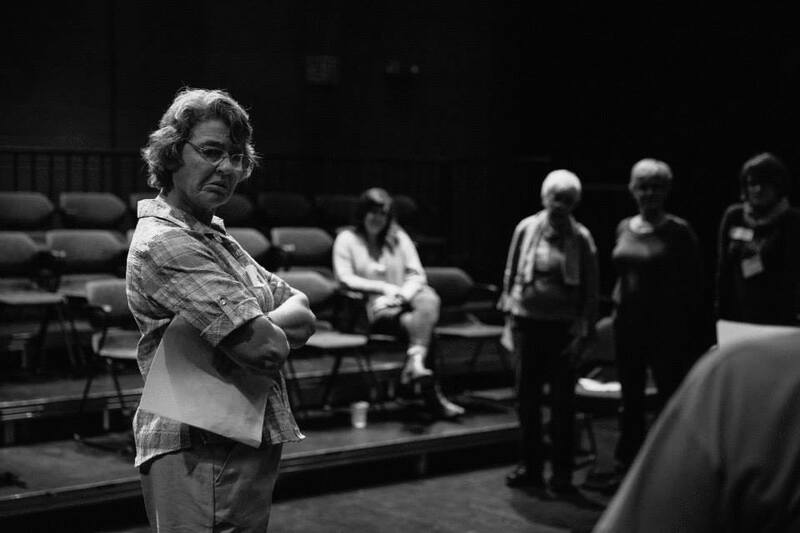 The GeriActors & Friends is an intergenerational theatre company based in Edmonton. The GeriActors are seniors from SAGE and the “Friends” are students and alumni from the University of Alberta. They range in age from early twenties to late eighties. The intergenerational nature of the company generates new energy, brilliant ideas, a great sense of fun, and lasting friendships. They write plays based on stories and issues from their lives. 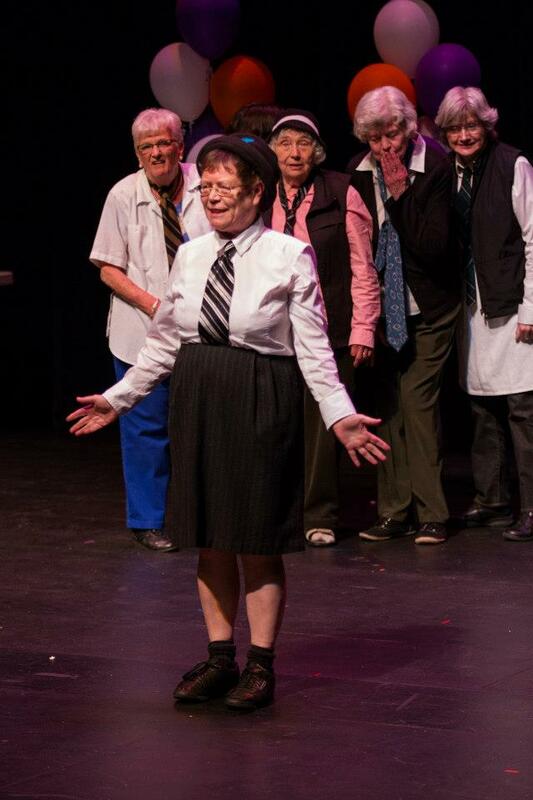 They perform to audiences of seniors and their families, students, health professionals and the general public and they are currently enjoying a very successful Spring Tour of their newest play Washing. Be sure to join them at the Arts Extravaganza to see their play We Decide When inspired by Shakespeare’s King Lear. The GeriActors & Friends perform Felixstowe at the Creative Age Festival 2012.